Home » And so it goes » Nothing really matters. Democrat elites take Elizabeth Warren out at the knees! THIS WAS A BRUTAL HIT AGAINST A SERIAL LIAR! The Washington Post reported this tonight! Elizabeth Warren apologized for claiming to be Native American for nearly two decades as she struggles to put the scandal behind her as she prepares to announce her 2020 Presidential bid. Warren apologized to the chief of the Cherokee Nation last week marking the first time she has ever apologized for falsely claiming Native American heritage. Elizabeth Warren released employment documents last summer to argue that she didn’t use her so-called ‘Native American’ heritage to further her career. Now we have evidence to the contrary. Elizabeth Warren filled out the registration card by hand and signed it. 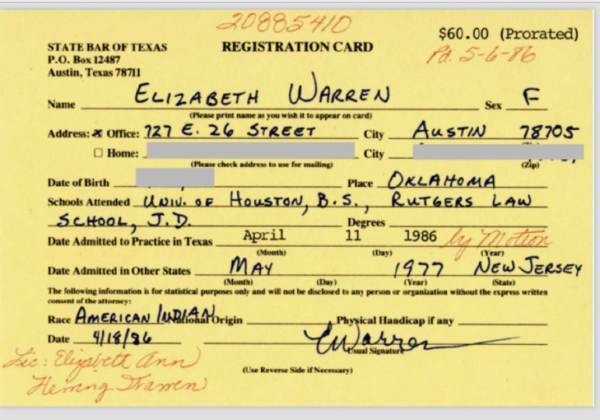 This Texas State bar registration card is the first document to be released showing Elizabeth Warren, in her own handwriting, indeed fraudulently used her ‘Native American’ heritage to get ahead. Warren’s office did not dispute the authenticity of the document, the Washington Post reported. If we had a real media, Elizabeth Warren would have resigned in disgrace years ago for her lies.